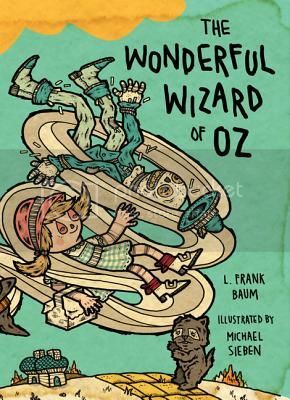 In this dazzling full-color gift edition, L. Frank Baum's The Wonderful Wizard of Oz is brought to life with specially commissioned illustrations by contemporary artist and designer Michael Sieben. Follow the yellow brick road with Dorothy and her friends as they travel to the Emerald City in search of the great Wizard of Oz in this new, complete and unabridged edition of the classic tale that winds its way from Kansas to faraway places and back. From the land of the Munchkins to the deadly poppy field, from encounters with ferocious Kalidahs, Winged Monkeys, and Fighting Trees to battles with the Wicked Witches of the East and West, the magic of Baum's story is beautifully reimagined through the extraordinary art of Michael Sieben. I loved The Wonderful Wizard of Oz when I was a child and I do admit that I still do. This is a new gift edition that I find is absolutely fantastic to give a child or to keep as a collection for yourself. I know I will be keeping this one and read it again and again in the future.